Thanos #3 finds the mad Titan squaring off against the Shi’ar Imperial Guard, but they aren’t the only ones out for Thanos’ blood! Thanos may have reclaimed leadership of the Black Quadrant, but the unthinkable has happened; Thanos is dying! Having slaughtered his father, Mentor, for failing to find a cure for his God Cancer, Marvel’s big bad must now face the entire Imperial Guard. Meanwhile, Thanos’ son, Thane, has recruited his uncle, Eros (the former Avenger known as Starfox), along with the mercenary Nebula who once claimed to be the granddaughter of Thanos, and Tryco, The Champion of the Universe, to kill Thanos! Thanos is without doubt the most powerful, ruthless, and fearsome God-like villain to have ever stalked the Marvel Universe. This new Marvel Comics ongoing series from Jeff Lemire, Mike Deodato, and Frank Martin has proved to be revelation, epic in scope, with striking visuals to match, and its brought us a brilliantly dark and insightful glimpse into the mad Titian’s world as his quest to find a cure escalates and his enemies conspire to destroy him. Having cut a savage path across the galaxies centres of healing in his pursuit of a remedy for his condition, the World Killer must now go toe-to-toe with the Imperial Guard! 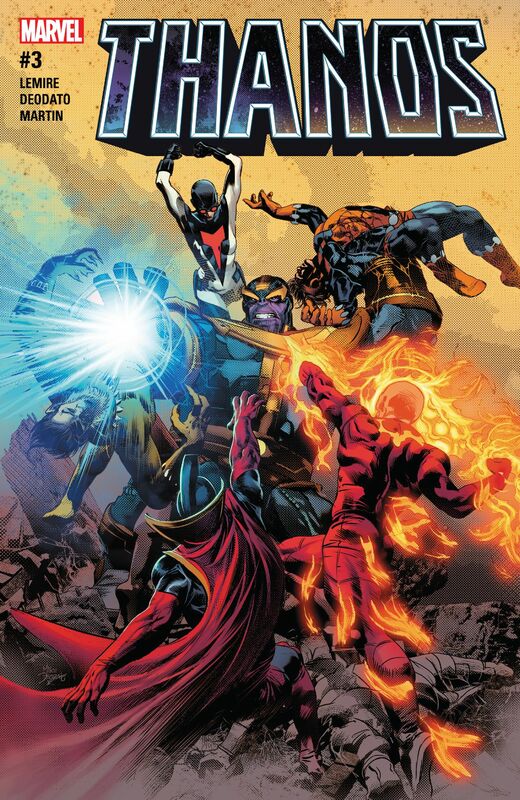 There’s nothing like a good smack-down between super-powered beings, especially when it’s on such a titanic scale as this, and writer Jeff Lemire goes for all-out blockbuster action as Thanos confronts insurmountable odds on Gilgrath on the fringes of the Shi’ar Empire. Lemire skilfully interspaces the bone-crushing action sequences with a fascinating trio of recollections about Thanos from interviewees that each have their own unique connection to Thanos, these dark vinaigrettes make the issue a compelling read, and the differing viewpoints offer a chilling and disturbing insight into Thanos’ past and his evil deeds in a way that is quite unlike anything we’ve experienced before. The frenetically paced action is realized to perfection by artist Mike Deodato, with big, bold panel layouts relaying the battle between Thanos and the Imperial Guard in singular detail, there are times you’d swear you can feel every punch and bolt of energy as they simultaneously pound and crackle from the page, while closer knit layouts bring added gravatis to the memories and spectacles of the narrated trilogy of flashbacks. A rich, vivid palette of tones and shades are employed by colorist Frank Martin to great effect, providing an impressive contrast between past and present, and even the darker hues seem to take on a bold vibrancy all their own in the heat of Thanos’ fight with the Imperial Guard, and the stunning cover by Mike Deodato and Frank Martin is another eye-catching snapshot of the epic conflict that unfolds inside this issue. The issue builds towards an exciting, earth-shattering showdown, as the big guns in this saga go head-to-head for what is possibly the most momentous development in this series so far! Thanos #3 is another excellent issue in this new Marvel comic book series, Jeff Lemir, Mike Deodato, and Frank Martin have taken the scope of the storytelling and the impressive artwork to a whole new level of excellence for this issue! Please tell me that ‘god cancer’ is your term and not what they actually call it. Thanos’ father, Mentor likened Thanos’ condition to this while he was running tests in issue #2, but its not actually been specifically called that, as we don’t actually know exactly what caused Thanos to become so ill yet. Sure that’s something we will discover as the series progresses. Nice review Paul, I’m definitely interested in this title but with so many others to buy these days it’ll have to go on the backburner. Hopefully check it out one day if it continues to go strong! This has turned out to be one of my favourite Marvel series at the moment. Every issue jumps to the top of my read pile when it comes out. Just wanted to let you know that I nominated your blog for an award. Check out the details here…. Great review – as usual. Quite shocked to hear that he killed Mentor. And, I think there is a bit of irony in the story to have Thanos, who has been a character who traditionally attempts to kill everything else, now the be one who is dying. Add to that the layer of seeking a cure…..NICE! I think the new Thanos series has been excellent, story and art wise. This series gives a fascinating insight into the world of the mad Titan, especially now that he’s dying, and it brings a whole new dynamic to Marvel’s major big-bad super-villain. I’m sure the aftermath of Thanos’ epic battle with the Imperial Guard will be extremely interesting. Cheers, glad you enjoyed the review, I love reviewing this series, its brilliant!